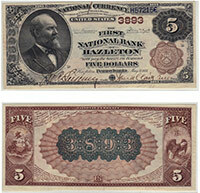 Current Market Analysis: Iowa is considered to be the birthplace of the national bank note collecting hobby. In fact the only museum dedicated to national currency is located in Iowa. The original dealers supporting our niche numismatic area lived and worked out of Iowa. That means that for almost six decades there have been collectors in Iowa trying to find great rarities from their home state. New and good discoveries from Iowa are few and far between these days. Most long terms collectors feel like they have seen it all before; and many times they are correct. When we think of Iowa, images of pen-signed notes from great town names (Spirit Lake, Hawkeye, Lost Nation, Jewell Junction, etc.) come to mind. We buy all antique paper money issued by The First National Bank of Maquoketa, IA. We can tell you how much your $5 bill is worth. We aren’t just dealers. We are also collectors, experts, and appraisers. We have contributed to numerous price guides and are considered specialists in the field of national currency. Contact us via phone or email to get your free appraisal today.